It’s mostly quiet on the river in the early morning; so quiet you can hear water gently gurgling around a bolder in the rushing current. It’s a sound that drowns your worries. When you’re used to the noise from cities and towns, — the traffic, the endless chatter from TVs and radios, the whistles, bells and horns that all rise in a senseless racket — when you’re used to that, what you notice first on the river is the quiet. A bald eagle flies overhead, its huge wings feathered in the breeze. Silent. Squirrels scamper among trees along the shore. Silent. Clouds float in the blue sky. Silent. Even the people are quiet, the fishermen along the banks wading waist deep in water as they throw line out into the river currents and wait; and wait. Except for an occasional motor from a passing power float boat, the only sounds are those that emerge from the river or the wind and it all feels very good against your ears. My friends Larry, Stephen, Troy and I went fly fishing in northern Michigan last weekend, drifting down the big Manistee River with no destination in mind; just two days on the water remembering that what we really are is just another part of nature — most of it more powerful, more beautiful, and far greater than we. I’m not really a fisherman. I have a brother-in-law and nephew who are great fishermen and they take me along. But calling me a fly fisherman is like calling a guy playing “Chopsticks” a concert pianist. Fly fishing is part sport and part art; a symphony of rod, reel and fishing line glistening in the sun as it whips back and then streams far forward, sailing over the water before floating gently down to the surface; all conducted by a person waving his arm in a fluid motion timed perfectly with the rod, the reel, the line and the river. I remember many years ago taking our youngest daughter, Beth, out in a rowboat on a lake in Pokagon State Park in northeast Indiana. She was 10 years old. I put worms on our hooks. We dropped our lines into the water again and again and waited for hours. “Dad,” Beth finally said. “I love you. But you’re just not a very good fisherman.” She caught a bluegill. But she was right and I knew it. It is my friends who have interested me in fly fishing, encouraging me along; rarely laughing when I get tangled in my line and turn that symphony of motion — line, rod, reel and river — into a discordant mess. “You’ll have an easier time throwing that line out if you’re not standing on it,” says our guide, Chris. And he laughs. 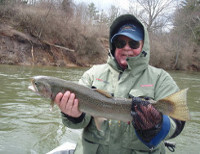 Wellston, Michigan is the home of Schmidt Outfitters, owned by Ray Schmidt a guy with white hair and a white mustache who looks like a fly fisherman — and is, in fact, a widely respected expert, as well as a widely liked guy. Ray and his wife, Angie, own a great lodge, fishing store and a guiding businesses, doing a wonderful job sending people whose time is limited onto northern Michigan rivers filled, this time of year, with steelhead trout — big beautiful fish that are a steely silver in the fall and slightly darker in the spring when they come in from Lake Michigan to spawn. Our guides are Chris and Bill. Larry and I went with Chris, Stephen and Troy with Bill. “Aren’t you the guy who lost that steelhead?” Chris asks. 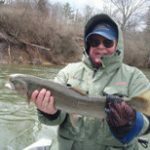 So Chris recalls in detail how I had mishandled my rod and line and let a 10-pound steelhead make a fool out of me seven years ago. “You’ve got a good memory,” I say. “Some thing are unforgettable,” Chris says, and he laughs. He has a big, loud laugh and it’s friendly and he puts his arm around your shoulder so you’ll know it’s all in fun. You hope. We get in our boat and move down the river to fishing spots known locally by names like owl’s nest, banana log, and three sisters. Larry points out logs stuck in high banks above the river that have been there since the clear-cut logging days 100 years ago. It’s early spring the trees are beginning to show a touch of green. Off in the distance trees sway in their spring colors: purple, red, yellow and green. But Chris is focused on fishing. He teaches me how to strip line off the reel and let it fall at my feet; how to take the rod back with my right arm and then swing it forward with an easy flowing motion, letting go of the line in my left hand at the last second. He shows me how it’s done and his line sails more than half way across the river. A lead weight on the line makes a plopping sound as it dunks beneath the water where the steelheads wait. He hands the rod to me. I hold the rod in my right hand, the line in my left, sway back and then forward and my line sails three feet off the edge of the boat and tangles in a huge bird’s nest of knots. It takes 15 minutes to untangle the mess. I finally get it right and my line sails across the river into the rushing current. The weight pulls it down to the river where it dances along the gravely bottom. I feel every bump through the rod held tight in my hands. Suddenly the rod and the line and the reel all come alive. The fish runs downstream. It jumps from the water and glistens sliver in the sun. It’s strong and beautiful. “Pull the rod back,” Chris says. “Then lean forward and reel in. Pull back, lean forward and reel in.” This went on for maybe seven minutes. It felt like an hour. He reaches into the water with a net and scoops up the steelhead. “You got it. You got it,” he shouts. I shout, too. Chris says it’s seven pounds, but I’ve been telling everyone it was 10. The steelhead is unhooked in the net, in the water. A camera is readied. We pick the fish out of the water, a photo is snapped and the steelhead is back in the river in a matter of seconds, swimming away. “You redeemed yourself,” Chris says. He laughs with delight. I caught two more steelheads during the weekend. Even more than that got away and I wrapped my line and flies in trees on the riverbank and in logs underwater. I had a wonderful time. Chris did a great job. I told our daughter Beth about the trip and the fish and how we sent them right back into the river. She felt sorry for the fish. “You still hooked them,” she said. I told her if it made her feel any better, I also hooked myself and the guide a few times and almost got Larry once. I’m back at work now and way too busy once again. The problems I lost on the Manistee have all returned. But in the darkness of the night when I close my eyes to sleep I no longer toss and turn. I remember the quiet. I hear the river gurgling around a boulder. A steelhead rises and leaps above the water, glistening in the sun. I’m with my friends. Chris laughs. And my sleep comes gentle and easy.